Lucky Angler: A Snowy Catch is a release from Net Entertainment which brings together two fantastically popular pastimes; fishing and online slot machines. At this point we should mention that the fascination of fishing has always eluded us but we are of course aware that large portions of the world’s population think differently and therefore a combination of slots and fishing should have wide appeal. 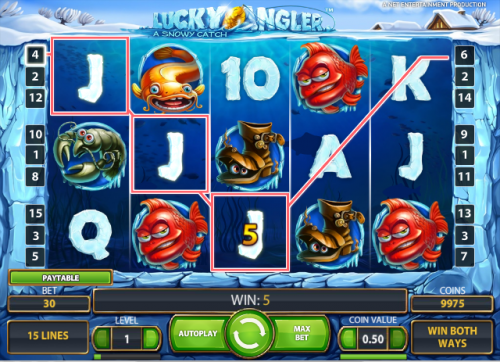 Lucky Angler is game based on ice fishing which features five reels and fifteen fixed paylines. It’s certainly a good looking game but by now we expect nothing less from NetEnt. There’s an icy backdrop and near the top of the screen we have ground level with the reels therefore underwater. The basic symbols are carved from ice and are the standard 10, J, Q. K and A with the important symbols being a selection of underwater denizens. One of the symbols is a boot but the rest are fish of different colours. We have a red fish, a blue fish, a green lobster and a yellow (cat?) fish. The wild symbol is a small fish on a hook while the scatter symbol is a small shoal of fish. Lucky Angler is one of the few slot machines out there which allows the player to make winning combinations from both left and right on the reels. Usually it’s just left to right but you get two chances with this game. Does it increase your winnings? You’ll have to play to find out. The wild symbol has an interesting little feature; if you land one and it makes a winning combo it will then freeze in place, making it available for the next spin. This will continue until the symbol fails to win. The scatter symbols will transport you to the ‘free spins’ round but you’ll need to land three of them first. On our test run it took some time to land three scatter symbols but it made us a lot of money when it did. You get ten free spins with a wild symbol frozen in the middle of the centre reel. Each further wild that you land will remain in place for the duration of the free spins. There are fifteen fixed paylines so the minimum bet is €0.30 per spin. High rollers will appreciate the €150 maximum wager per spin. So maybe we don’t like fishing but we do like Lucky Angler; it’s a well presented game with some extra touches which we’ll certainly come back to.